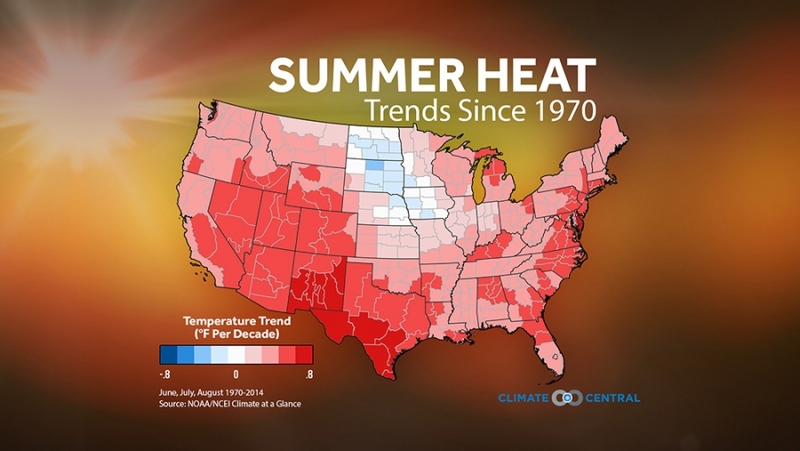 Nationwide, summers are getting hotter as greenhouse gases continue to climb. Hotter days increase the incidents of heat stress and heat exhaustion. Additionally, air conditioners must work harder, placing higher demands on the nation’s aging power grid and increasing electrical bills. Heat waves often come with large domes of hot air with little movement. This leads to air stagnation and trapped pollutants, further worsening air quality and increasing respiratory stress. In all of the NCEI (formerly NCDC) climate regions, there has been a warming trend since 1970. However, within those regions are smaller climate divisions where we see a more varied rate of warming. For example, in the Northern Rockies and Plains Region, a few divisions have shown a slight cooling since 1970 while others have warmed as much as 1.99°F — leading to an overall warming for the region. Nationwide, the most dramatic warming is evident in parts of the East Coast and the Southwest where temperatures in some of those divisions have risen more than 3°F since 1970. This serves as a reminder that even in an overall warming world, not all locations will warm uniformly.